Raqibul Hasan was born January 15, 1953, Dhaka. He is a former Bangladeshi cricketer who played in 2 ODIs in 1986. He is widely regarded as one of the best Bangladeshi batsman of his era. Raqibul played in two ODI's for Bangladesh. He scored 5 against Pakistan and 12 against Sri Lanka in the second Asia Cup in 1986. Raqibul Hasan was one of the more inexperienced players in the Bangladesh squad for the Under-19 World Cup in Sri Lanka. One of his impressive qualities as a batsman is his ability to build an innings and thus protect his wicket. He made his ODI debut in the home series against South Africa in March 2008 and got a call-up to the Test squad later that year on Bangladesh's return tour. His positive 65 against West Indies in Grenada helped Bangladesh win their first Test series abroad. But things went downhill for Raqibul after the tour of New Zealand, when he was dropped for the home ODIs against England as well as the 30-man probables for the World Twenty20. Find Raqibul Hasan profile and stats of batting, bowling and fielding including latest updated news of Raqibul Hasan, videos and images at Hamariweb.com. 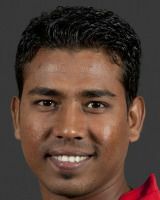 Also find detail Player profile and career statistics of Raqibul Hasan of Bangladesh. Raqibul Hasan - Find Raqibul Hasan of Bangladesh Cricket Team complete player profile, number of matches, runs score, wickets & catches, Statistics, Records, Raqibul Hasan Latest News, Raqibul Hasan Videos, Raqibul Hasan Photos, and other Raqibul Hasan Cricket Team players.